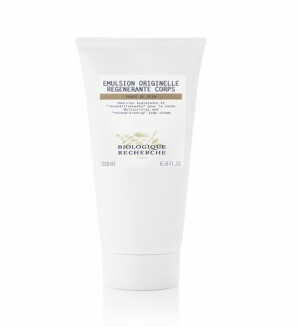 Emulsion Originelle Régénérante Corps is a moisturising emulsion enriched with replenishing active ingredients which protects the epidermis from extreme weather conditions thanks to its “reconditioning effect”. This comforting cocoon cream supports skin elasticity, softness and vitality and promotes cellular renewal. Composed of brazil nut oil to relipidate, hyaluronic acid and colostrum to moisturise, and vitamins E and F to protect and restore the skin, this cream will leave you feeling nourished and hydrated. Nourishing, moisturising and protecting, it will act as your all-encompassing survival blanket. Lipid reconditioning agents: Brazil nut and Priprioca oil, Virgin Sisymbrium Oil, Squalane. Moisturising agents: Hyaluronic Acid, Colostrum, Sugar derivatives. Protective and restorative agents: Opuntia Ficus-India extracts, Mimosa extracts, Centella Asiatica extracts, Vitamin E, Vitamin F.